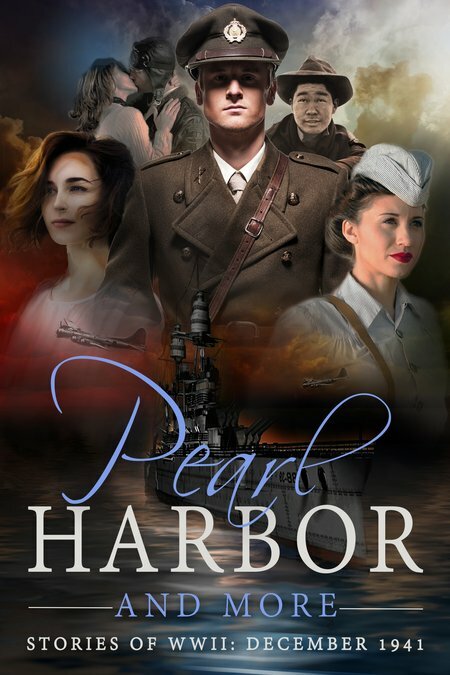 This wide-ranging collection of eight stories by a diverse group of authors, who write wartime fiction, commemorates the 75th anniversary of the Battle of Pearl Harbor. Few people’s lives were unaffected in some way by that fateful day and these stories reflect this. The authors invite you to step into December 1941 with them. Deadly Liberty by R.V. Doon: Connie Collins, a navy nurse on the hospital ship, USS Solace, takes liberty the day before Pearl Harbor. Her budding romance wilts, an AWOL nurse insists she find a missing baby, and she’s in the harbor when WWII erupts. Under fire, she boards the ship–and witnesses a murder during the red alert chaos. When liberty turns deadly, shipmates become suspects. Time to Go by Margaret Tanner: A young sailor, who died at Pearl Harbor, finally meets his soulmate on the 75th Anniversary of the battle. Will she be prepared to leave the 21st century with him? Or will they forever remain apart? I am an American by Robyn Hobusch Echols: Ellen Okita and Flo Kaufmann are high school seniors in Livingston, California. Ellen is a first generation American who lives in the Yamato Colony, composed of about 100 families of Japanese descent. Flo’s father is a first generation American. After Pearl Harbor, the war hits home fast and brings unforeseen changes to them and their families.A Rude Awakening by Robert A. Kingsley: Singapore, December 1941; the fortress sleeps, believing its own tales of strength and invulnerability. A rigidly class based society throws garden parties and dines sedately, disregarding the slowly growing number of warning signals. Suddenly, the underestimated enemy ferociously attacks and the myth of invincibility is shattered forever.